Honey Almond Challah Bread Recipe: Sponsored by Bob’s Red Mill Natural Foods | Exploring Food & Drink in D.C. Combine sugar and almond meal by whisking. Heat milk to 100 F Degrees. Add yeast to top of sugar and almond mixture. Do NOT stir in. Pour milk over mixture and yeast. Allow to foam for approximately 15 minutes. Whisk in melted butter, honey, and egg yolks until combined. When dough has become sticky, turn out onto counter and finish incorporating the ½ cup of leftover flour by kneeding. Place dough into a well greased bowl. Cover with a damp towel and allow to rise in a warm spot 3-4 hours. Dough should double in size. Once doubled, punch dough down, and set aside while prepping your work area. Turn dough out onto work surface and divide into three equal parts. Roll each part into a 2ft+ long ropes. Press 3 ends together and make a tight braid. Wrap the braid around itself to form a ball, and close ends by pressing together. Cover, and allow to rise another hour. In the meantime, preheat oven to 350 F degrees. Mix your egg wash ingredients together with a whisk. Place dough on non-stick baking sheet, or wax paper. Brush egg wash over entire surface and sides. Serve warm with additional honey. Bob’s Red Mill sponsored two of our recipes this month as part of the Blogger Recipe Challenge. We were provided with a variety of nut flours and meals to use at our discretion including natural Almond Meal, Almond Meal/Flour, Hazelnut Meal/Flour and Coconut Flour. 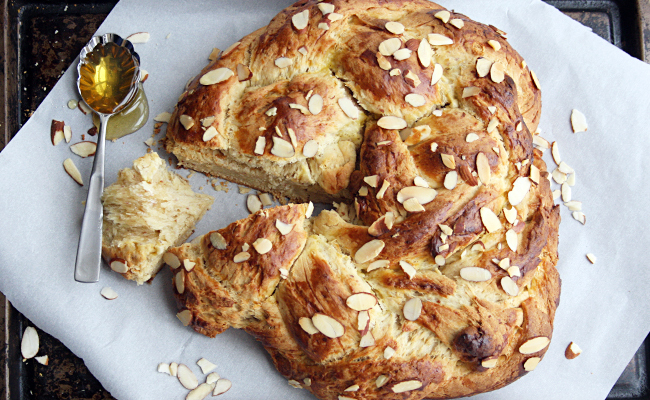 We opted to try a recipe we’ve never made before, and went with a Honey Almond Challah bread. Also never having worked with Bob’s Red Mill before we weren’t exactly sure what to expect with nut flours and meals. We were pleased to find that they were easy to work with, added a great flavor complex, and that the Natural Almond Meal not only added a nice darker color to our dough due to the almonds being ground with the skins intact, but the meal is also Gluten Free. Not that we have issues with gluten, but we have several friends that do, and imagine this would probably be a fantastic gluten substitute. Bob’s Red Mill Almond Meal can also be purchased through Amazon. We’re thinking for our second recipe this month we’ll be experimenting with the hazelnut flour/meal. Perhaps some sort of chocolate hazelnut pastry? Hmmm…. Tags: Blogger Recipe Challenge, Bobs Red Mill, Bread, Gluten Free, Honey Almond Challah Bread, recipe. Bookmark the permalink. I have plenty of Bobs Red Mill products in my home, and I’d love to make this recipe for the Lenten season. Not only does it sound good, but it looks pretty. What a mouth-watering photograph! That looks delicious. Bob’s Red Mill makes great flours! Oh wow, that looks delicious. I am a a big fan of challah bread a a general rule anyways, but this is a nice twist on it. This looks amazing! Fantastic photo! Great staging on your photo. I really want to try Bob’s Red Mill. This recipe looks so good! I have always wanted to try making challah! I am so going to make this. I bake challah but have never seen this recipe … yum!!! Can’t wait to try it. This looks really good! I am a huge fans of almonds, so this goes to the top of my must-try list. A beautiful photo! Never had this before but looks good. we use bobs red mill too. great products. and i love love love challah! It’s so cool that this is gluten-free! My daughter would go nuts over this bread. If she replaces the all purpose flour for a gluten free mix…only the almond meal is gluten free. It’s awesome that you’re trying some new things you may not have used before. Sounds like it’s working out perfectly! I have everything on hand for this… except time. Maybe over the weekend. Your bread looks flawless! Mine would have a serious lump or something. oh my goodness that looks wonderful! I so want this now for breakfast! Bob’s Red Mill is my choice for so many items! Quality products! The bread looks delicious! That bread looks delicious! I use Bob’s Red Mill products as well! I actually never heard of Challah bread until recently. I’d love to try this recipe. Oh my goodness, this bread looks amazing. I am bookmarking this recipe, and can’t wait to give it a go! I love almonds So I will be making this recipe real soon! Yum! That looks amazing! Can’t wait to make some of my own. Wow, this recipe looks super good. It looks yummy. I have never had Challah bread before.